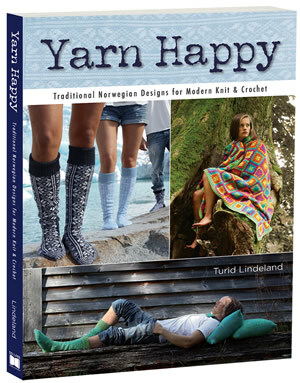 Yarn Happy by Turid Lindeland is full of 30 knit and crochet projects that represent the simple and clean design style that Scandinavia is known for. The designs are photographed in the dramatic Northwest region of Norway that inspired them (and the photographs, which are numerous and full of beautiful colors, are amazing!). Projects in the book include modern takes on traditional Norwegian knit designs, including socks, blankets, chair covers, crochet throws, and more. Yarn Happy is designed for both for intermediate and experienced knitters, as well as fans of colorwork. The patterns include pattern charts and detailed instructions and include both US standard and metric measurements, and alternative yarns are included for each pattern. Turid Lindeland’s inspiration for Yarn Happy came from an old sock she found in a crumbling hotel in Rosendal, Norway. Inspired by that old sock, and the neighboring glaciers called Folgefonna, with their dramatic icy colors and shapes, she has given these classic patterns an updated twist by employing modern color palettes. Some patterns are informed by the cool shades of ice and others by the summertime landscapes with their vibrant colors. If I have one criticism about Yarn Happy, it’s that it’s really a book for knitters – not for crocheters. The 30 patterns include only 2 crochet patterns, both of which are granny style throws. However, the knit patterns are stunning. The skilled knitter will truly enjoy making the patterns which include numerous socks, throws, pillows, jar sleeves, sweaters, a seat cushion, chair cover, laptop cover, iphone case and even a bow tie. Yarn Happy is available for purchase at Amazon. This entry was posted in Crochet, Knit and tagged Turid Lindeland, Yarn Happy.